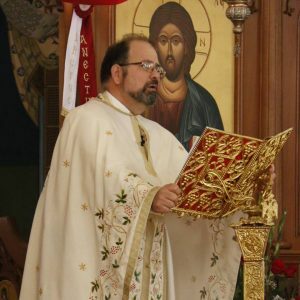 My name is Father John Athanasiou and I am the priest at St Nektarios Church in Dianella Western Australia, having so been appointed in November 2013. The Church of St Nektarios is owned by the Greek Orthodox Archdiocese of Australia. I write this short piece in the hope of inspiring you to service. A short history of my life is as follows: I was born in Kalamata, Greece in 1950. I came with my parents to Australia in 1956. I was born the middle child of a family of five boys and like most migrant families worked long and hard to establish ourselves in Melbourne, Australia. The early years were tough but probably no more tougher than what most migrants went through. Learning the Greek language was a very low priority and the focus was establishment, consolidation and on education. In 1972, whilst on holiday in Perth, I met my future wife Marina (nee Kakulas) and was married in 1974 having received the degree of bachelor of laws (LLB) from the University Western Australia the previous year. In 1975 I became principal in an established law firm specialising in family law in the Perth central business district. In 1994 I became an accredited family law specialist which accreditation I held until I ceased practice. I have three children two girls and one boy, all married, all lawyers and all who work together in the same legal practice previously operated by me. In 2004, I commenced a Master of Arts in theological studies (MA) from the Greek Orthodox Archdiocese College of St Andrew’s in Sydney, which course I found a joy to do. I graduated in 2008. In May 2011 I was ordained a deacon at the church of St Constantine and Helene in Perth. On the feast day of St John Chrysostom ( 13th November) 2011 I was ordained a priest at this church, the church of St Nektarios. In November 2015 I was appointed and became priest of St Nektarios and have since been responsible for the needs of the Parish. I’m often asked what motivated me to leave a successful legal career and become a priest in the service of the Lord. I wish I could give a clear answer to that question. I know that it took years and years asking the Lord to show me direction. That direction, when discerned by me seemed as if it was coming out of a fog – it certainly wasn’t an epiphany nor was it a road to Damascus moment as experienced by St Paul. What I do know is over a period of time the calling grew stronger and there was an increased clarity as to what I should do with the next stage of my life. I recall coming to the view that statistically we now live long enough to have two work pathways in life: the first career to meet the responsibilities of life and the second pathway to allow for spiritual growth and development. In hindsight one can say that the idea was foolish – but it pleased God to let it come to pass. I do know that something inside made me want to complete my studies in Sydney and I found ample time to do them as well as run a busy practice. So, what are my practical gifts to priestly ministry? I acknowledge that I cannot sing, cannot speak Greek well, have troublesome knees and (like all of us) generally struggle with temptation. Strictly speaking, if I were an employer I would not employ me. Yet, I must have some redeeming features which humbly gives me the opportunity of serving this parish – even if those redeeming features escape me. What I do know is that each of us has something to bring as offering to God – and it is enough – for God knows the tasks he intends for us. Our hope is that even if we are the most miserable of vessels the Lord finds a use for us – and you know what? If we listen, he always does. My principal motivation in spreading the word of God has been the following: a number of years ago I was watching a group of enthusiastic five-year-olds playing soccer. They were having a great time – running around, laughing, enjoying themselves milling after the ball. I was asked my impression. I responded that the children appeared to be having a great time but they didn’t seem to be following the offside rule. The response let me with a lasting impression: “first we teach them to love the game, and then we teach the rules”. It occurs to me that this is how we should all grow to Christ. By growing to love him we want to know more about how we can be closer to him. By learning how we can do this we grow to love him more. Thus we embrace the rules of our faith is an expression of our love towards Christ. We thereby grow in faith. I write this confession so that I may motivate others who are mature, established in life, have met their responsibilities in life and are looking for something more than material rewards for the balance of their earthly life. I would want you to consider the possibility of going back to university – even if it is by long-distance to the theological College in Sydney as I did. I want you to consider taking a place of service in the church – and yes – even the priesthood. We oldies have lived experience, the capacity to deal with problems that life throws up at us and the insight to bring people closer to God. By doing God’s work in his vineyard, where ever it may be, we are acknowledging that we are fully utilising whatever talents we may have. My core understanding is this: if we can do all that we can in following Christ then, being able to do no more, we rely in confidence and in hope upon His great mercy for salvation.